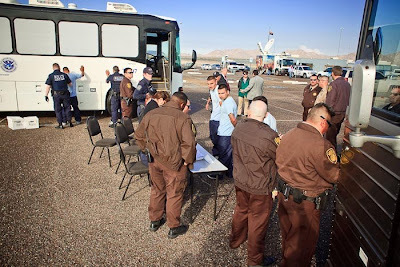 The photos: top, inmates are transferred from the Arizona DoC bus to the federal ICE bus and, bottom, inmates were searched and handcuffed by federal agents before boarding the federal bus. In a budget cutting move, Arizona lightened its prison population by 51 inmates early this morning when the Arizona Department of Corrections turned the inmates over to the federal Immigration and Customs Enforcement (ICE) branch of the Department of Homeland Security. The men, all undocumented immigrants serving time for various criminal infractions not related to their immigration status, are within 90 days of the end of their sentence. They were turned over to ICE and will be returned to their countries of origin when they finish their sentences. Normally these kinds of prisoner transfers are done outside of the media spotlight, citing privacy and confidentiality. But the Arizona budget is in such crisis (2nd worse budget situation in the country after California. Go California!) that state political leaders wanted that they were doing something, anything, to save money. This transfer will save the state about $3,500, not much considering our $1,000,000,000,000 (that’s billion) + deficit. But it’s a start.